Luke Wood ’91, President of Beats by Dr. Dre, believes that putting yourself out there is the only way to the top. Speaking to an audience of prospective students in the Gordon Career Center on Thursday, Wood discussed his time at the University, his career path to Beats, and what it’s like to work in the music industry today. The talk was sponsored by the Career Center as a part of WesFest. Wood always surrounded himself with music growing up. He taught himself guitar at the mere age of twelve, played in several bands, and even curated his own music. So, by the time he arrived at the University in 1987, he had already recognized that his calling would be in the music industry. Booking music performances in the space that formerly housed the Eclectic Society, and playing music across campus, Wood considered himself “one of those punk rock kids” who found comfort in numbers. But his most influential moment at the University came in a class called “Baseball and Metaphysics,” where he realized that he could learn in any environment. Wood also pursued his professional life during his time at Wesleyan. During a semester off, Wood interned at A&M Records, worked as a publicist during his junior year, and was a temp at Geffen Records the summer going into senior year. The day after he graduated, Wood was hired immediately by Geffen Records. He initially focused on indie rock, first signing artists like Elliot Smith, but then eventually gravitated towards aggressive and “emo” music, signing bands like The All-American Rejects and the Yeah Yeah Yeahs. “Those of you who have brothers or sisters that went to Hot Topic—that was my zone,” Wood said. But once Napster came along, the record industry nearly collapsed, and Wood left to work for music producer Jimmy Iovine, who co-founded Interscope Records. They both were frustrated with the dying music industry, and wanted to recreate the sound that connected them to their passion. And that’s where Beats began. In 2008, they came out with Beats. As the CEO and one of eleven employees, Wood dove into the technology side of the business, becoming proficient in the intricacies of headphone designing, building, and team collaboration. He also described how committed Beats became in terms of diversity, gathering workers from all different walks of life. The second most significant aspect of building Beats was focused on how they treated the product: like every headphone is its own band. In August 2014, Beats was sold to Apple for $3 billion. By that point, Iovine and Wood went their separate ways because they had also started a music subscription business, Beats Music. 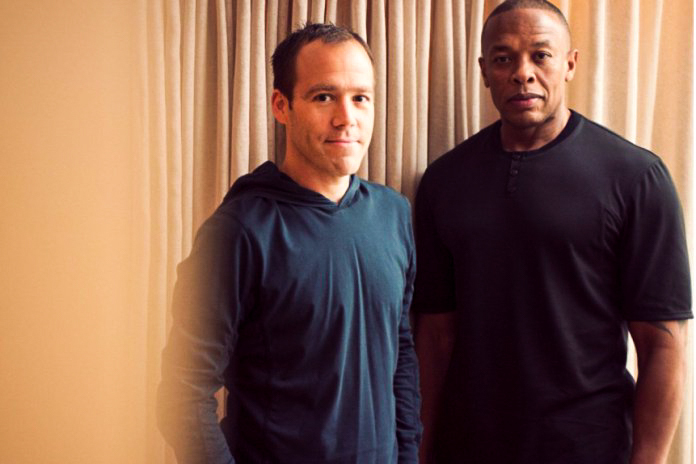 Wood took over Beats Electronics and Iovine oversaw Beats Music. Wood has run Beats Electronics ever since. “We’re a really successful brand that just continues to grow,” Wood said. The talk concluded with a Q&A with the audience, where Wood discussed what it’s like working with Dre, how he markets products, and the most successful ways to enter the industry. He left the audience with career advice.